Today I am grateful for my hands! There is little I can do in my garden without my hands. I would have no way of touching and feeling the soil, delicately moving small seedlings and digging out beautiful baby potatoes like I did this morning. How grateful I am that I have these amazing tools to create and build what ever I want in my garden. My Two Gardens gardening buddy, Christine, and Cat of The Whimsical Gardener, has invited Garden Bloggers the world over to join in the 30 day challenge of posting a photograph and sentiment of that which you are thankful for – every day for 30 days. We all have something to be thankful for. See Christine’s and my posts filed under “30 Day Challenge“. 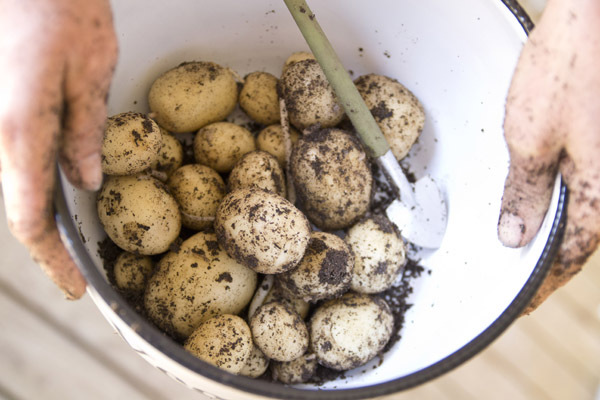 Nice looking potato harvest! And a good reminder that my best garden tools are often my hands! Oh thank you – this is my first time ever! This is why my camera is so filthy. At least you have the sense to let somebody else take the shots when things are grimy.